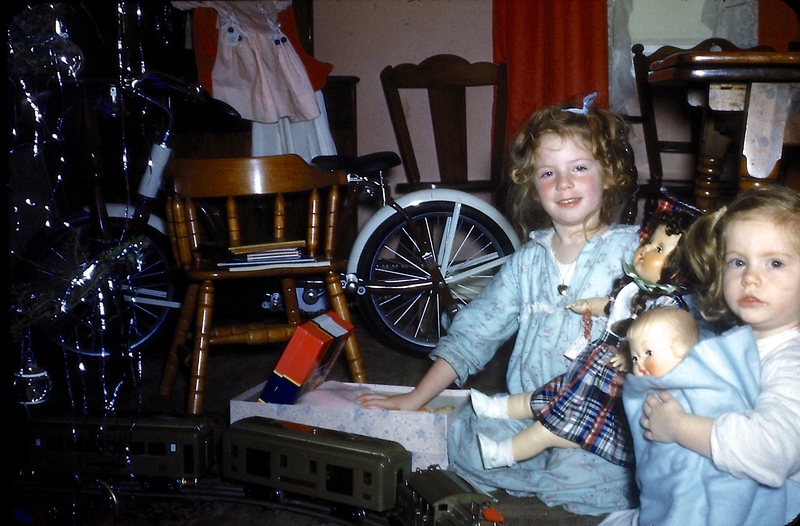 Working-class suburban children had more toys than kids from any previous era, although we had nothing to compare what life was like for children who grew up during other times or places. We didn’t know how lucky we were! Economic prosperity followed World War II, and parents had some expendable income and prices were relatively low. Parents expected us to share our swing set, wading pool and sandbox with our neighborhood friends. While we had many toys, they did not waste away in a mountain of plastic. 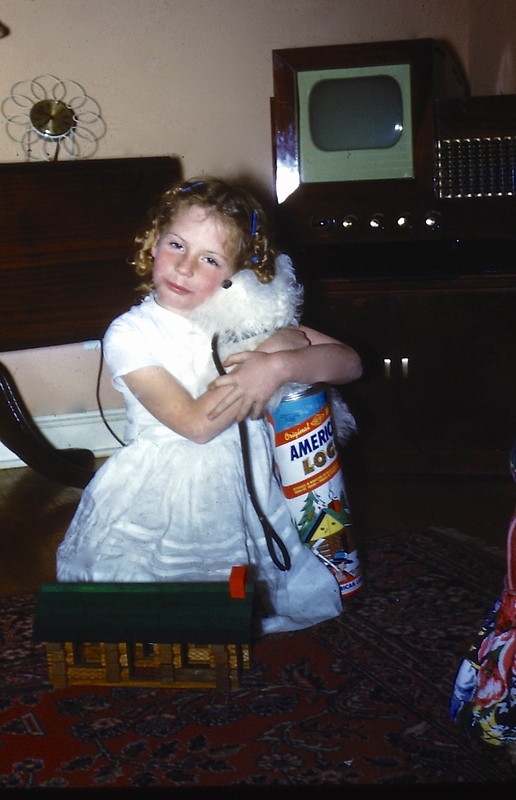 We played with each toy, and parents were generally careful about buying too much. Toys fell to pieces from wear. Kids had time to play, as we didn’t have many chores, and mom was home to take care of the house, for most of us. In our family, our parents impressed on us to take care of our things, and if we didn’t, that demonstrated we would not be not entitled to any more. Santa delivered many of our toys on Christmas morning. My mother told me that when I was three, I exclaimed that I heard Santa’s sleigh bells, which kept me believing in the jolly old elf for years. 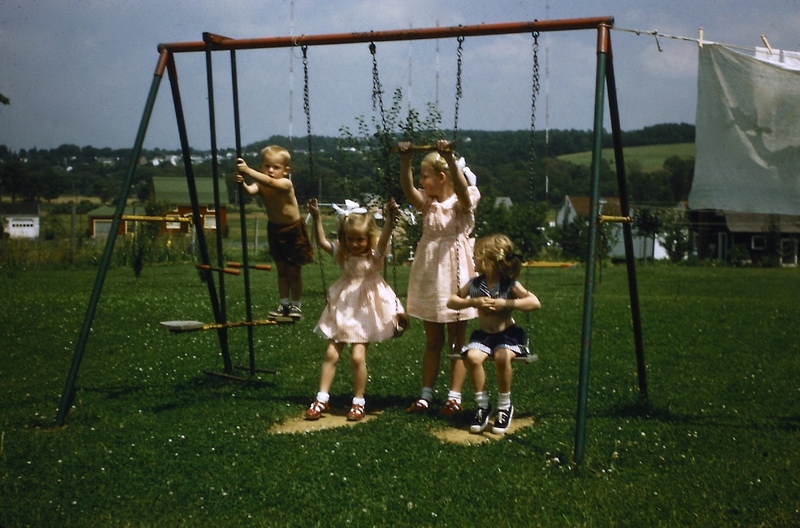 The 1950s brought in the era of reasonably priced, if not terribly safe or functional, swing sets. Some sets offered options, such as rings, gliders, ladders or a slide, which would get burning hot in the summer. Fathers plunked the sets down in the middle of the yard on the hard earth without sand or wood chips. When swinging more than slowly back and forth, the entire set would fly up in the air. My dad added boards to the bottom to stabilize the set. Nevertheless, the swings became a place to hang out, if nothing else, passing the odd moments between other activities. Milling around the swings, we would start a game of tag, freeze tag or hide ‘n seek, hop scotch or jump rope. On summer nights, we’d find glass jars and collect lightning bugs. Suburban sidewalks and patios provided the perfect platforms for the metal roller skates with the leather straps. A key locked the skates to our shoes, and off we’d go around the neighborhood. In the winter, we signed up for ice skating lessons at the local rink, earning different color buttons as we moved up through the various skill levels. There was always a program at the end of the season to show off our talents, and the best part was wearing a fancy costume. We skated on creeks and ponds and at the tennis courts, which the township fire trucks would hose down to create smooth surface. Kids under six would ride tricycles. Made of heavy steel, the trikes usually had a little platform in the back where a friend could go for a ride as we peddled. 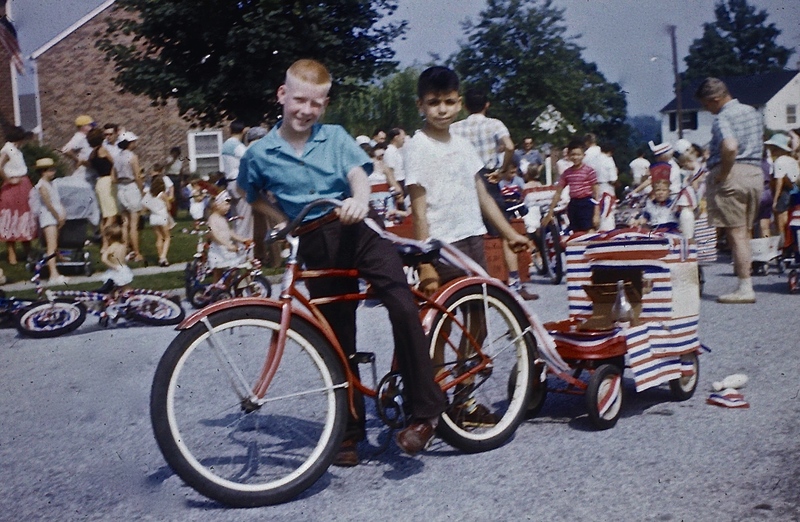 Most, but not all, children in our neighborhood owned a two-wheeler. 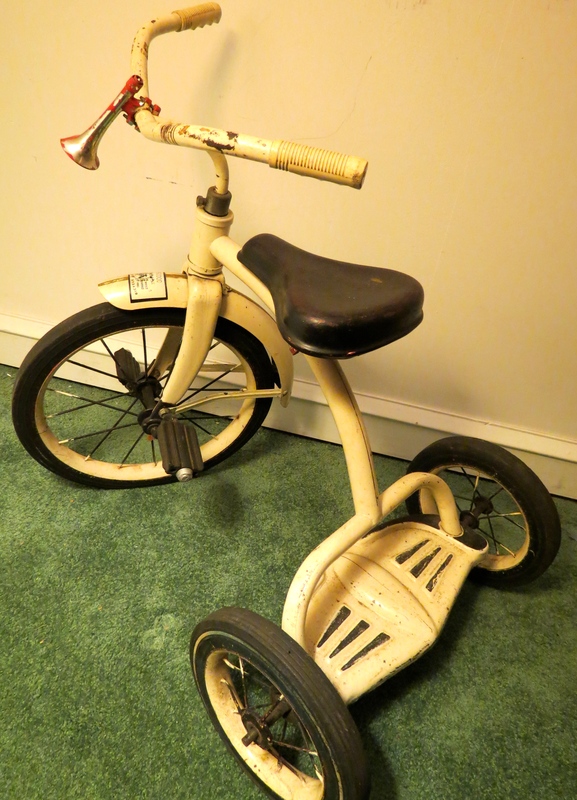 The popular Schwinn was equipped with foot brakes and large tires. A durable bike, it was difficult to peddle on steep hills. Some rode their bikes to school. Later, we graduated to the English bikes with gears and hand breaks. Because of the ease of peddling, we ventured further out of our neighborhood to explore local towns. Our municipality required bike licences, and we would ride up to the township building to go though the testing, which usually consisted of riding in a circle and straight line. Baby Dolls: Our cuddly baby dolls, made of vinyl soft plastic became our first favorite doll. Some had rooted hair that we could brush and some could be fed with a bottle and wet a diaper. Our layettes included blankets, pajamas, booties, and assorted outfits. We had cribs and baby carriages for taking our babies out for a ride in the neighborhood. Every night we would put the dolls to bed in their little cribs. I played with my Shirley Temple baby doll so much, she eventually disintegrated. Walker Dolls: As we grew older, we graduated to a walker doll, usually about 14 inches tall, their legs and head would move together. These dolls were porcelain with mohair wigs and eyes would open and shut. Some of these dolls came in bride outfits. My friend, Joan, had the Ideal Toni doll, associated with the Toni cosmetic company, and came with her own permanent wave kit. I believe my doll was an American Character Sweet Sue. Joan and I had many of the same outfits for our dolls. We usually kept their clothes in small suitcases so that we could carry doll and outfits over to our friends’ houses. My the time my parents purchased a walker doll for my younger sister, the popular Shirley Temple, they were mostly made of plastic with rooted hair. Madame Alexander and Ginny Dolls: These were the eight-inch little girl dolls, and we collected dozens of outfits for them and had at least two dolls. The accessories were endless: slips, shoes, socks, handbags, hats and headbands. The clothes were detailed and well-made. Our moms helped us create beds out of cigar boxes, using clothes pins as legs. Mom made little blankets, sheets and pillows. We could also buy furniture, including patio and bedroom sets. In the picture below is the cardboard suitcase that Ginny carried back then. 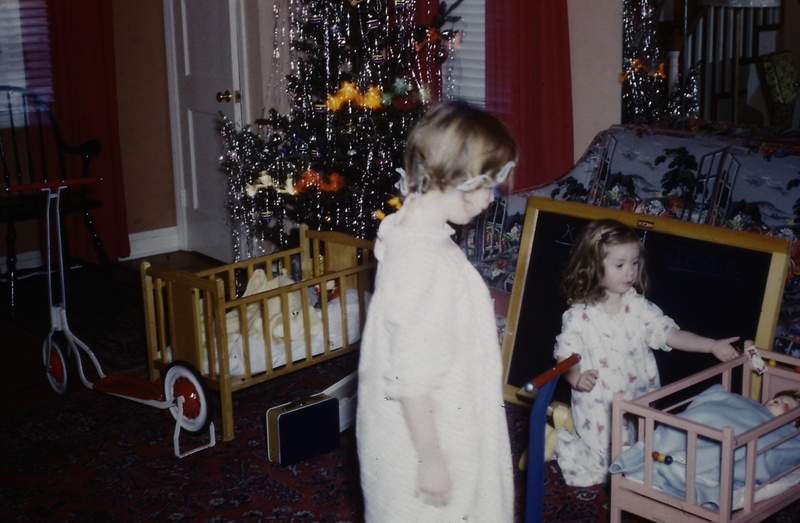 The price was still marked on the box: $1, for a nightgown, slippers, robe and towel. High Heal Fashion Dolls: In the late 1950s, the 8-inch high heel, or grown-up doll, became popular. This doll was the precursor to Barbie. The dolls were proportional but designed to wear high heels. We could buy a variety of outfits and accessories including nylon hose, simulated pearl necklaces and earrings, and fancy undergarments. The Revlon Fashion doll was the most common, but one manufacture created a doll after a local Philadelphia television celebrity, Sally Starr, hostess for Popeye Theatre, which ran from 1955 into the early seventies. Like Sally, the doll was dressed in a cow girl outfit with hat, boots, gun and holster. 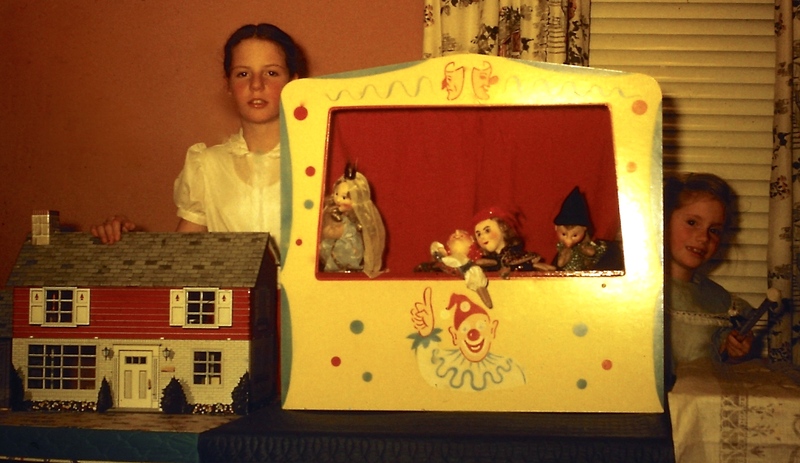 We had two metal doll houses, which came with moulded plastic furniture for every room. The miniature pieces, brightly colored, represented detailing of wood, bed linens and upholstery. In the photograph above, a colonial house, made by Marx toys, resembled our two-story home. My sister and I spent hours rearranging the furniture, trying to decide the aesthetic placement of all the little pieces. We would make up stories using the plastic characters that came with the set. 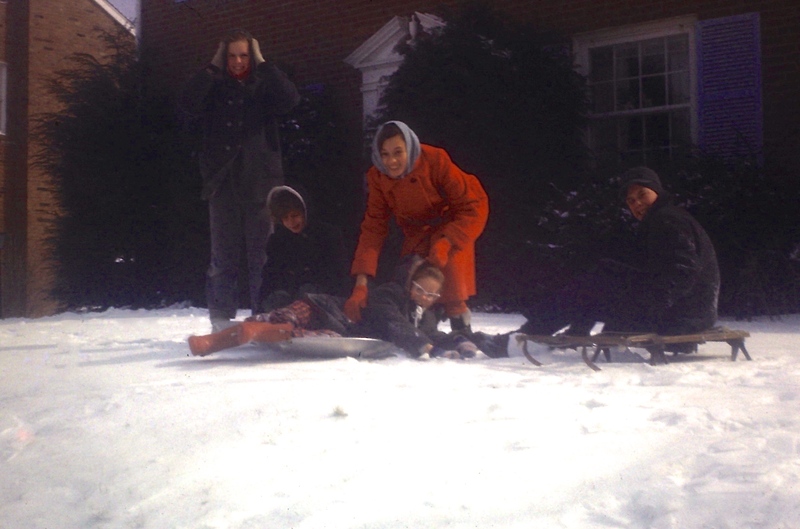 Most kids had the American Flyer sled, made of wood with metal sliders. Our neighborhood had a great hill for sledding so at the first snowfall, we’d be out on the hill before the cars and snow plow removed the snow. Later, we used the aluminum twirling sleds, the circular disks that would twirl down the hill. Boys had several different toys than their sisters. Boys would run around the neighborhood playing cowboys, donning hats, holsters and fringed shirts; in several blog posts I write about how television, especially the Westerns, influenced play back then. Erector Sets, a collection of metal pieces, including wheels and gears and an electric motor, could be put together with nuts and bolts to build any number of mechanical contraptions. Interestingly, girls did play with Lincoln Logs. Why were girls given Lincoln Logs and not Erector Sets? Maybe tool use was considered too masculine for girls. Boys also had model train sets, usually set up around Christmas and placed around the tree. Some boys had train layouts in their basements. During the holidays, my father would set up his train set from the 1920s for his daughters. I liked the train but was more interested in arranging the houses to make a holiday scene. All the Others . . .
We had more playthings in our toy chests: tinker toys, hula hoops, paddle balls, balsam wood gliders, slinky, view master, jump ropes, paper dolls, crayons and chalk. We spent many hours playing games with our friends: Old Maid, Canasta, Clue, Checkers and Chinese Checkers, to name a few. We had a wonderful time with the variety of toys available to us and developed friendships that formed around the games and toys. If you have written a blog post about toys in the 1950s, please include a link in the comments. Thanks again for sending the photographs of Toni. Seeing the doll again was like meeting an old friend. We had so much fun back then!